Kent & East Sussex Railway are holding some frightful Halloween events this year starting from 24th October. See below what's on at the railway over the spooky period. Have a fun day out at Tenterden’s Steam Railway this Halloween with a relaxing return train journey between Tenterden and Bodiam stations hauled by a heritage steam or diesel engine and enjoy all the free family-friendly events including ‘Mr Mystery’ magic show and pumpkin carving. 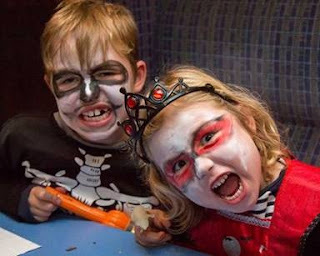 Why not arrive in fancy dress and visit our face painters to complete your scary look! At Bodiam station passengers can alight to see the exhilarating birds of prey flying demonstrations where birds dive and swoop over the station with Bodiam Castle in the background. There will be two flying demonstrations each day lasting approx. 30 minutes. Train travel and events are all included with the purchase of a Travelcard. When purchased in advance online TravelCards are: Family £36.20, Adult £16.20, Child (3-15) £10.80. When purchased on the day TravelCards are: Family £38, Adult £18, Child (3-15) £12. The green timetable will be in operation during October half term with both steam trains and the heritage diesel observation train. Visit the railway from 4:30pm for a Fright Night workshop including pumpkin modelling and facepainting. Families are encouraged to come in fancy dress, the scarier the better! Spooky music and an amazing live Firebreather will add to the atmosphere before everyone boards the Fright Night Express in time for a 6:30pm departure. Children will receive a Munchbox during the journey. Hotdogs or hot snacks will be available to purchase from the licensed restaurant to eat in or take on the train. Upon arrival at Northiam station enjoy a firework display before the return journey to Tenterden which will see the train arrive back at the station for approximately 8:15pm. Fright Night fares: Adults and Children 3-15 inclusive £18.00. Booking for Fright Nights essential.